On February 20th, 2016, a man was taken from us. He wasn’t a great man, but he was a good one. To me, he was everything. 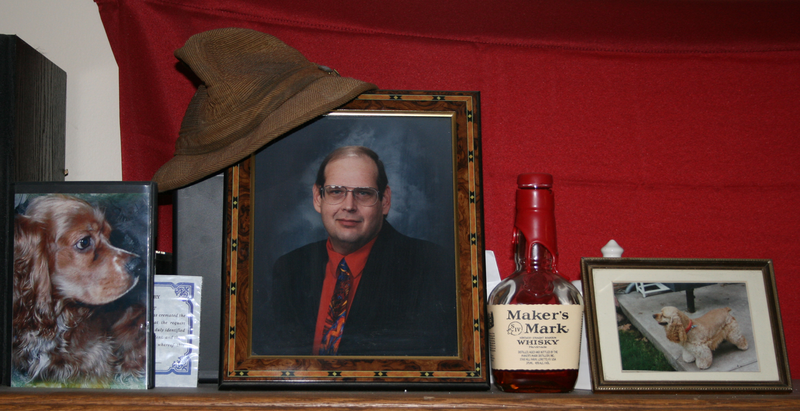 Stephen Anselm Johnson was my father, my guardian and my best friend. He was there for me when no one else was. He took me in when I had nowhere to go. He provided for me even when it meant sacrificing what he wanted. He listened to what I had to say, and imparted what knowledge he had in return. We shared many of the same attitudes, humor, likes and dislikes. I could not have asked for a better man. Then he was taken from me. This was the moment when the world said, “It’s time to stop being a child. You’ve had 39 years, now be an adult.” Even when he was sick, even when I was the one taking care of him, I hadn’t truly “grown up.” There was still a large part of me that refused responsibility, a part that believed everything would go back to the way it had been: Dad would take care of me. He always had, he always would. In retrospect, he did take care of me in his final months. Even as my depression, anxiety and stress reached new heights, he stayed optimistic. When we were facing eviction, he trusted that I would find a solution–and with one simple suggestion from him, I did. When the medical bills piled as high as a mountain, he trusted me to manage the finances–and I did. And his final gift to me is the home we shared ever so briefly. He insisted it be in my name. He said it was in way of thanks for all the care I’d given him, but I believe he knew deep down that he didn’t have long. He was looking after me and my future. So when the time came, his optimism and patience had paid off. He had helped me become the adult he always believed I could be. These were my father’s final words to me. He wasn’t able to speak them, and barely able to write them. I’ll never know exactly the true meaning behind them. The best I can assume was that Dad was talking about letting go. It was the only thing the doctors and I could seem to communicate with him about in those final days. He was going, and he knew it, but never was he ready to let go. Dad fought for every minute. When he was still able to talk, all we talked about was what he would do once he was finally home: wonderful meals were planned, home improvements were discussed, and all of our conversation points about life, the universe and everything were bantered about. We talked about these things as if they were fact, inevitable. Dad was coming home, he was going to get better and we were going to have many years to come in our new home. Up until those last few days, we had no reason to believe any different. I’m thankful for the extra days I was given to spend with Dad. Earlier that week I had the heart-to-heart with Dad about these things we should have talked about months ago, but never had the courage for. But we finally got everything sorted out… almost everything. There was one very important thing left in the hospital’s hands, and they literally lost it. I was angry with them, but it turned out to be a blessing in disguise; it gave me a few extra days to say goodbye. He was revived against our wishes, but I was told he wouldn’t survive the weekend. As I said, though, Dad wasn’t about to give up. The weekend became a week. Sadly, I was unable to spend all that time with Dad. My compound stress reached breaking point at Dad’s near death, and me out extremely sick for two days and bedridden for a third. Luckily the nurses were keeping me up-to-date with his condition and his prognosis was slowly improving. Which is why it was such a shock when I got the call that he was fading quickly. I didn’t even have time to get to the hospital. There was little grieving to be done. Not that there wasn’t time, but rather most of it had already been done. What I felt most was relief that his suffering was finally over. There were tears, of course, I am still human. But time moved on, and I had to go with it. The worst part of it all was the first few months after. I had accepted his death, as harsh a reality as it was. But there was a part of me, so conditioned to him coming in and out of hospitals for over two years, that expected to get a phone call any day telling me my father was stable enough to come home, to come pick him up. In some ways, it was worse than the initial grief. But as I said, time did not stand still. I had to be the adult. Bills to pay, mouths to feed and a furry friend to take care of. It hasn’t been easy, but I knew it wouldn’t be. I’m in a good place, but I still have episodes from time to time, and I haven’t done anything writing-wise in almost a year. But these are the wages of a soul-crushing, go-nowhere job. One day at a time, it is getting better. There’s been some seriously tight scrapes, but I’ve kept my head and gotten through them. I’ve changed a lot in the last year, and I like to think for the better. Whenever I falter, I think of how there was one person who was always there, always believed in me, and helped me become the person I am now, able to face the future with the confidence that I can get through it. I miss you, Dad. And I love you. Always and forever. This is a story of a children’s magazine. It may not seem like it at first, but as always, I get there eventually. I can still remember much of my hometown’s main public library. All I have to do is close my eyes and I’m flooded with so many minor details that went completely unnoticed in all the days of my youth spent there—obviously not completely so, since my brain picked up on them even if my conscious mind didn’t. It’s a four story building that was what I would call then a ‘square doughnut’. The first two floors surrounded a middle area which held an enclosed garden that open to the sky. There were windows on looking in on it from all sides so you never felt enclosed. Even the slow but serviceable elevator had a glass side to look out over it as you went up and down. The decor was very much a 60s style: sharp lines and curves shapes combined and colored in muted tones that I’d only ever seen in magazines and visiting my older relatives. The periodicals were kept in the basement. It was only two large rooms, one for the archives and one for viewing them. The smell of aging newsprint permeated everything, but not in an unpleasant way. I like to think it added to the ambiance. The microfiche machines were an endless fascination to me, reading through old newspapers and picking up bits and pieces of history. I once thought they were just humoring me when I would ask for random dates that I’d pulled from the catalog, but now I think that their smiles were more genuine, that a kid would actually be interested in that kind of stuff was a pleasant surprise. Then there were the two main floors. The first floor was mainly fiction, with a small section for reference books (of the ‘how to’ sort), the main checkout desk and card catalogs. Tucked away in a corner next to the stairwell going to the basement was a film archive, both reel-to-reel and VHS, with private viewing stations. Being a kid I mostly watched the cartoons. But one of those ‘cartoons’ was The Snowman, a hauntingly beautiful short film that beautifully haunts me to this day (if you haven’t seen it, watch it. Don’t argue. Go, watch. I’ll be here when you get back). The second floor held almost everything else. More fiction (including the comic strip collections, which I never got tired of reading), nonfiction and the audio section, which had both audio books and music albums both modern and classical. There was even an art gallery. Yes, they lent you prints. You could take home art with a library card. That still blows my mind. The third and fourth floors… to this day, I’m still not sure what all really went on up there. They didn’t go all the way around like the first two floors, squatting there on the far corner from the street. The windows looking out were tinted, and the main area was never brightly lit. On the third floor there was a small room dedicated to authors from Nebraska, another room that was only open whenever there was a book sale and the rest was a complete mystery. The elevator doors opening onto the third floor (the fourth needed a key) was like opening up into a different world. As an adult, I realize now that it was probably where the library offices are, partially open to the public but by and large not meant for it. I’d probably be gravely disappointed if I were to return today, so I’ll keep that little bit of memory as a memory because it’s more fun my way. The enclosed garden was also a little world unto itself, though a much more terrestrial one. Stepping stones were scattered throughout clusters of plants that had little plaques with plant names and their genus species, a couple of small trees, a pump-fed stream and two small ponds on either side. It was open to the public most days of Spring and Summer, even to the kids. Though not very many besides myself would go out there. They did what maintenance had to be done, but mostly let Nature do its thing, which for me added to its appeal. You’re probably getting bored by now. We’re almost there, I promise. Just a little more rambling. Finally, we come to the children’s section. Counting the Young Adult shelves, it took up almost a third of the first floor—and this was no small building. It was a full quarter of a city block. One side was a glass-enclosed area where the bulk of the children’s books were kept. This is where I got to sit on beanbag chairs and get to know the works of Dr. Seuss, Shel Silverstein, Mercer Mayer, Beatrix Potter and countless other names that I can’t think of but would recognize instantly. The main area held the aforementioned Young Adult books, plus a little spillover from the previous room, more traditional tables and chairs for reading and a listening station for children’s albums. It even had a door directly to the garden area and out to the street. It was its own small library inside of the big library instead of just a section where it all got dumped. And then there was the magazine rack. It took up a good-sized portion of a wall all to itself and was filled with every kid’s magazine imaginable—though as an adult, I have to raise an eyebrow at their inclusion of both Mad Magazine and Cracked. While not adult in the National Lampoon way, they certainly weren’t humor geared towards kids. But then again it’s not like they had a separate ‘teen’ section so you take what you can get. All of these magazines had another thing in common: passed around dozens of grubby, clumsy hands on any given day, they were naturally mauled pretty heavily. Loose or missing covers, torn or missing pages, no thought put into where they were supposed to be placed on the rack. It was always a chaotic riot of colors and print. But again, these are kids we’re talking about, so it’s to be expected. You takes your magazine and takes your chances that some big selfish dummy hasn’t ruined this month’s issue of Highlights by circling all the differences or giving Goofus and Gallant an ink makeover. But there was one magazine that was always untouched. One magazine that sat in a corner of the rack all but neglected. There was nothing fancy about it. It didn’t have pictures on every page. It didn’t have any bright, flashy attention-grabbing glossy covers. It was mostly page after page of words with little doodles throughout. It was the most boring kid’s magazine you could give to your average kid. I wasn’t your average kid. And that magazine was Cricket Magazine. T his little publication was a hidden gem that I’ve only come to fully appreciate as an adult. For those of you unfamiliar with it, it’s a literary publication for children, with every story and work of art submitted by children. The ‘doodles’ were a cast of insects— including the eponymous Cricket— and other little critters kibitzing on the submission in fun yet constructive ways. It also had book reviews submitted by children, so these weren’t the books the grown-ups said were “recommended reading”, these were true peer reviewed books. It was these reviews that steered me towards the likes of Redwall, A Wrinkle In Time, A Wizard of Earthsea and many more like it, books I could sink my teeth into and expand my mind instead of simply entertaining it. 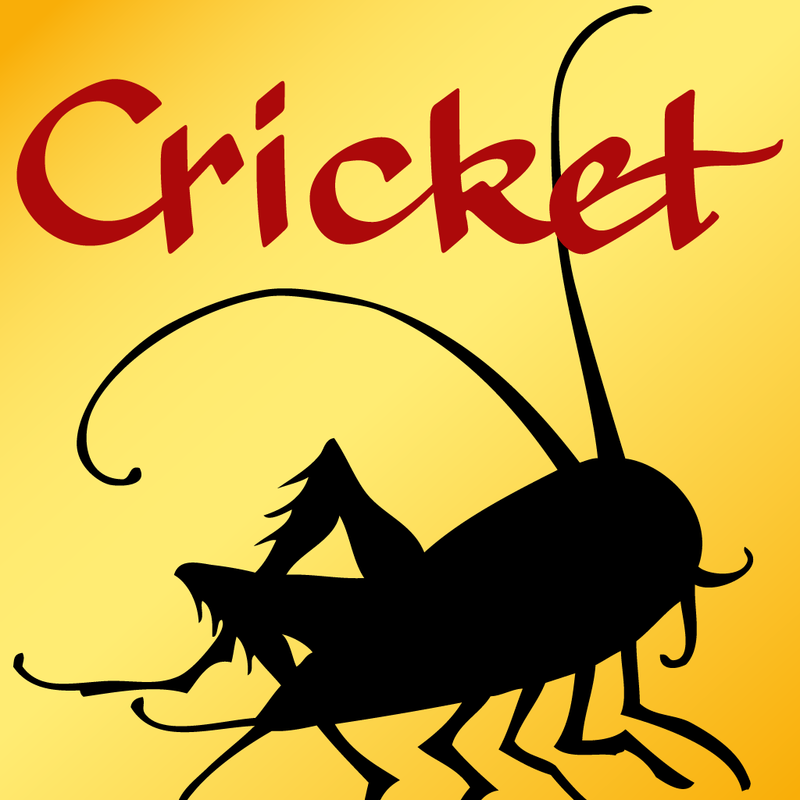 But the most important part of Cricket Magazine to my childhood was its inspiration. I wanted to be in it someday. I wanted to write a story that would be read by everyone who knew the magazine existed. I wanted to open up an issue and see my name on the Table of Contents. Cricket Magazine planted the seed that made me want to be a writer before my age was even in double digits. Sadly, I never got to make that dream a reality. The ambition never went away, but I was too busy being a kid to focus on the task. Now, I’m an adult trying to make it as a writer. The ambition that was born from a neglected literary publication for children remains with me in a likewise grown up but still largely unchanged way: I’m gonna do it someday. And just like then, there’s still a part of me too busy trying to be a kid to fully focus on the task. That’s my excuse and I’m sticking to it. 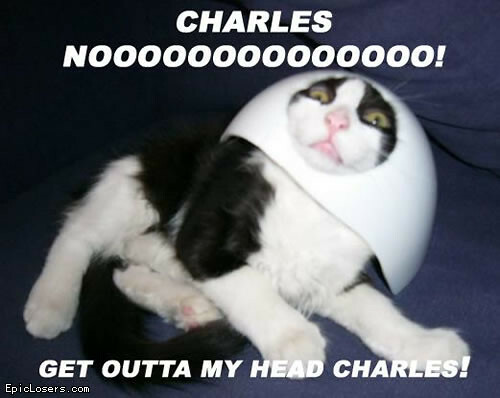 Get Out of My Head, Charles!! I’ve had a very active imagination from a young age. I started playing Dungeons & Dragons while still in single digits, along with a plethora of other role playing games between then and now. I would go to my best friend’s house and the two of us would take turn making ‘movies’ with his ridiculously huge collection of action figures, vehicles and play sets. As I entered my teenage years, my characters began to become much more developed. I finally understood the concepts of personalities and back stories. Every single last one of them, from ones I’d had since I first started playing to the most disposable character created for a one-shot game session, got the same treatment and became ‘real people’. As a result, they began to get their own ‘movies’ as well. I would have a gaming session, and in the time until the next one I would act out the characters—what they would do and say in situations that had arisen or might arise from the developments of the previous session. All of this took place, as Eddie Izzard once said, in my mind (if you’ve seen the routine, you’ll know why it’s italicized). My interest in becoming a writer also developed in my teens. Being a voracious reader as well, I began to get a better grasp of sentence structure (with a generous amount of help from my English classes, of course) and got a general idea as to how to tell a story. I finally had both the knowledge and opportunity to present the ‘movies’ I was making in a format that was easier to follow—and arguably a lot more interesting—than simply telling people the elaborate stories I had created in my mind. I didn’t stop with just tabletop characters either. I had several characters that were never put down onto a character sheet. Some were characters that I never got around to making, others were ‘personas’ I had adopted when playing with friends that stuck in my memory and some were simply ideas that had popped into my head. And then I stupidly listen to that voice and never write it out. Now we come to the Magic Spreadsheet. I’ve only been going at it for two weeks now, but it has been a tremendous help to my writing. I’m getting something down every day, even if it’s only a few paragraph. However, I must confess that the last few days, I’ve been flagging. Where I started out strong, pumping out three to five times the minimum word count for the day, the past few days have seen barely over the minimum. The worst part is, I knew this was going to happen. I’m falling into my predictable pattern of early enthusiasm followed by lethargy that sits there staring back at me and only muttering a “meh” when confronted. I recognize that part of this is the problem mentioned above. I have lots and lots of words crammed in my head and a self-defeating ability to never get rid of them in a useful manner. I hate it. I really do. It only leads to disappointment for everyone involved and only I can change that. Well, I’ve decided to try a new tactic to combat this problem. The idea came to me two nights ago as I sat around surfing the Internet and suddenly realizing it was 10 minutes to midnight and I hadn’t written a single word. Before the Magic Spreadsheet, I would have just said screw it and completely written off the day. But no, I had to get something down. Not only for myself, not only to keep the streak going and maintain my ‘score’, but for the person that introduced me to it and more importantly, believes in me. I didn’t want to let her down. I’ve done it too much already, no matter how much she may deny it. So I just started writing. But not just random thoughts that tumbled around in my head. I focused on getting just the conversations down. I figured once I got those out of the way, I could go back and flesh out the rest when I wasn’t in a slump. Lo and behold, it worked like a charm. I let the dialogue spill out onto the page and the minimum word count came and went without even noticing it. I’ll be trying this tactic from now on whenever I feel like I’m in a slump. It’s really only a minor variation of the mantra, “Write it down, make it pretty later.” And it feels like something I can manage. Olfactory memory is something that has fascinated me for some time. I was recently linked to an article that showed a definite link between smells and memory. I doubt it’s the first time such a study has been conducted, because this was something I, as a young teenager many years ago, believed to be a real thing. I used to call it “memory smells”. It was the best way I could think of to describe how certain smells would trigger not necessarily distinct memories, but more often simple reminiscence of places I’d been before, in some ways putting me back into those places to ‘re-experience’ them. I’m really not sure how much sense I’m making, here. It’s hard to put something like this into words. Hopefully, if you’ve felt it (or something similar) you know what I’m talking about. Today I experienced something which was almost a reversal of that. Instead of a smell triggering memories, it was a memory that triggered the reminiscence of certain smells. At the end of a nap today, I had a very brief dream just a second or two before I woke up. In it, I was on the first day of one of my handful of manufacturing jobs I had after high school. I was being shown around the various machines where I would be working on finishing parts. Just as I awoke, I had a crystal-clear remembrance of my junior high shop class. More specifically, the odors it had. The warm odor of plexiglass being smoothed on a bench polisher; the slightly acrid yet strangely appealing scent of burned carbon; the unmistakable smell of wood going through a table saw or pushed a little too hard into a belt sander. In an instant, I had such a clear memory of all of these smells and more of my shop class from over two decades ago that I could almost smell them. And each memory of those smells brought with them equally clear memories of the shop class: the feel of the materials I worked with, the plans I had drawn up and submitted to the teacher for approval. The sounds of the machines and my friends and fellow students. The mistakes I made and the sense of accomplishment when making something exactly as the schematics said. For just a few seconds after waking up, I was back in that junior high shop class, reliving events that I had consciously forgotten for years on end. All because of a dream that reminded me of what it all smelled like. I’m still smiling about it.